Living abroad is an awkward decision to make. It’s not easy to leave your home for a place you don’t know for sure if you’ll feel comfy. But on the other hand, it’s also very fulfilling to change your residence and get to know a new country or a new culture. The properties in Emirates are quite interesting, because they’ve managed to combine traditional and modern styles. This can be seen by strolling through its suburbs, where the houses are older, built in the ancient style, compared to the big cities, where tall buildings predominate and the architecture becomes not only modern but sometimes with a futuristic touch. Dubai is one of the clearest examples of cities where these trends are intertwined. This city has become an important economic and business location within the Arab Emirates and it has grown enormously in the last few years. In the architectural tradition of the Emirates, buildings used to be constructed very close to each other, creating narrow hallways between them to help the air to flow, while residents could also avoid excessive sun exposure. The old houses in these areas have rooms with access to the courtyard, and covered galleries. The patio has the function of helping to produce air currents, by letting the hot air to rise and be replaced by the cooler air coming from the rooms. The wind towers used to carry the air to the rooms below. These modern but old-fashioned homes may also have balconies and internal corridors. Specifically, Dubai has gained fame for its impressive modern buildings. It has become a paradise for architecture. The Burj Khalifa Hotel stands out as the tallest building in the world, with a height of 829.8 metres. In addition to the hotel, it has private homes, restaurants, offices and a lookout point. It also has the world’s fastest elevators and the highest swimming pool. Meanwhile, Burj Al Arab is a luxury hotel that measures 321 meters high, and is the only one with 7 stars. Its appearance is very interesting because it looks like a sailing ship, or more precisely, a typical kind of boat from the region. 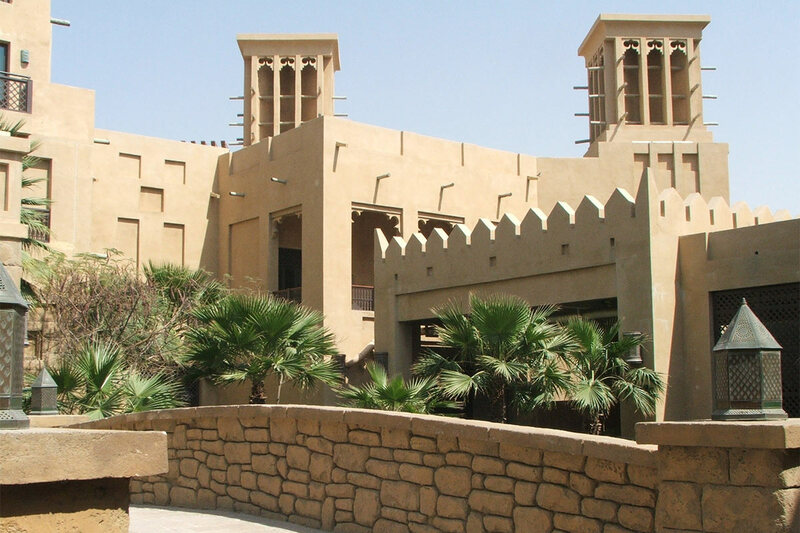 Totally different but also worthy of a special mention, Madinat Jumeirah is a souk reminiscent of an ancient Arab city. Its architecture evokes an earlier era and because of its beautiful canals it’s also known as the Venice of the Middle East.